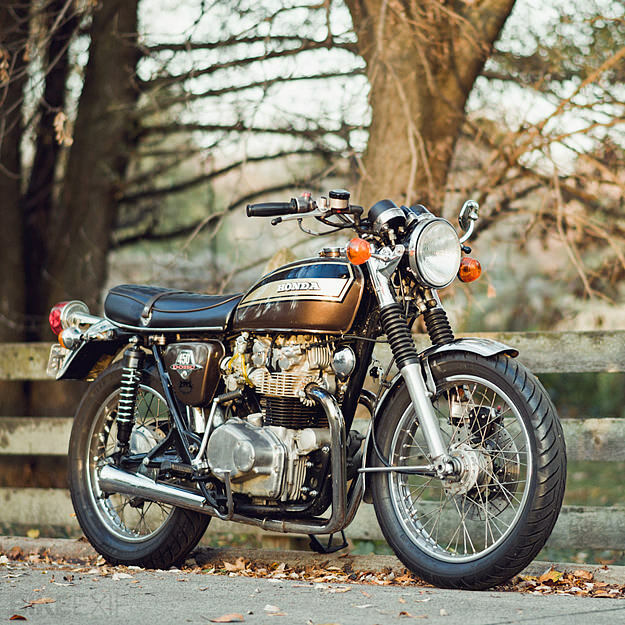 BlueCat Motors of St. Paul, MN is the kind of motorcycle shop that every town should have. It’s run by enthusiasts who are comfortable working on both vintage and modern machinery. 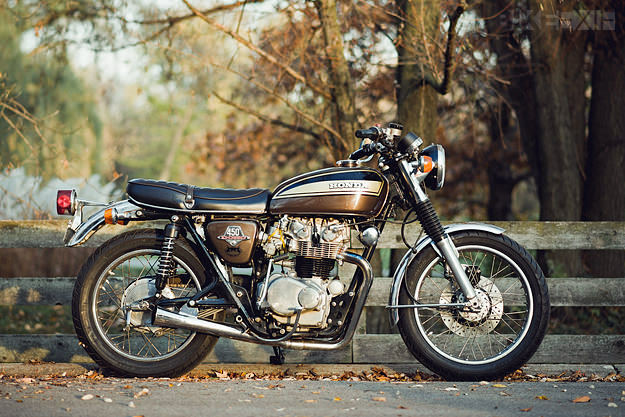 BlueCat often resurrects older bikes, and this beautiful 1974 Honda CB450 K7 is a prime example. It started as a “runner” but was then heavily modified to suit the owner’s size: at 6’3″, Nathaniel Salzman is a big guy. And although his CB450 looks mostly stock at first glance, there are a dozen unique touches that make it special. On to the mods: The front fender, grips and kick start lever are from a Honda CB550. The foot pegs (lower and further back than stock) are from a Honda CB500T, as are the finned valve covers and a handful of internal engine components. 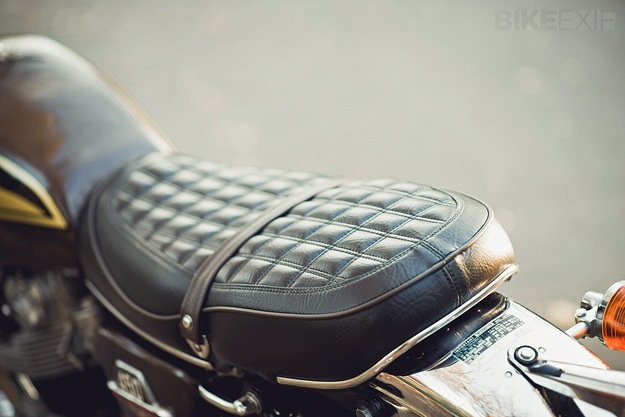 The round tail light is taken from a Yamaha XS650, and matches all the other circle elements on the bike. Mechanically, the engine was rebuilt and tuned for low end and mid-range grunt. The exhaust is a vintage 2-into-one performance pipe with custom baffling. (“The sound it makes is more of a v-twin note. It’s deep and loud, but not obnoxious.”) Higher sprocket ratios let the bike take advantage of its new power band. 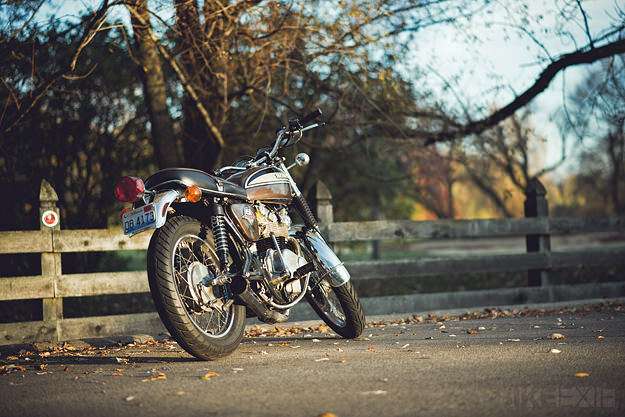 The CB450 also received a new charging and ignition system. To further account for Nathaniel’s size, the front suspension contains many skunkworks components and adjustments. A pair of adjustable Progressive Suspension rear shocks completes the package. 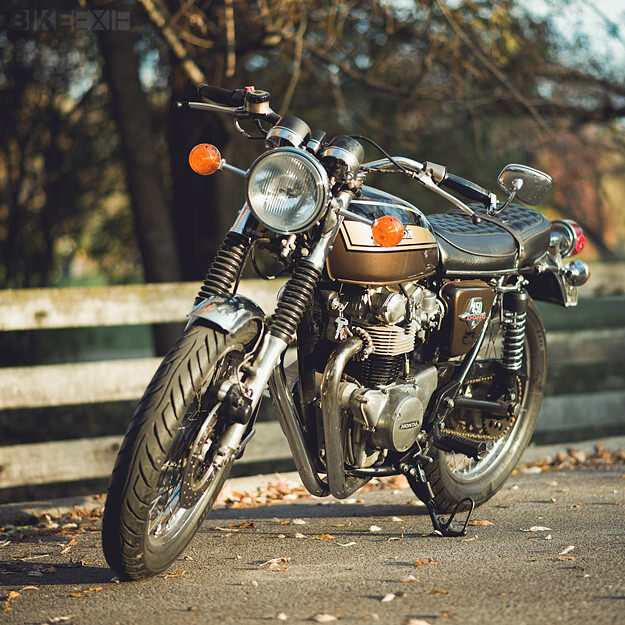 Nathaniel likes it: “This 40 year-old CB450 handles better than most modern bikes I’ve ridden. As capable as it is, it’s also surprisingly comfortable, like some kind of luxury sports car. The suspension is dialed in just right for my weight, and the chassis is completely neutral. It’s solid and stable, yet really nimble. The growl and torque from the engine, plus this terrific suspension, it just devours country backroads. Then again, I’m also content just to sit in my shop and look at the damn thing. It’s just so beautiful and full of character. Images courtesy of (and thanks to) Juan F. Hernandez.